Limiting Beliefs – Dichotomies: Happy or Rich, But Not Both? How much is enough? Do we need to make trade-offs to receive some of what we want but not all of what we want, so we do not appear to be greedy? Do we need to make choices to accept one thing at the expense of another? 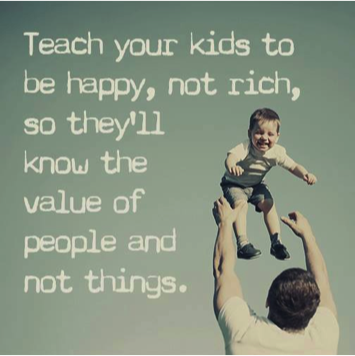 “Teach your kids to be happy, not rich, so they’ll know the value of people and not things.” This is a typical message in so many posts on social media, in articles and in some books. Does this mean that if you are rich you cannot know the value of people? These kinds of messages lead or contribute to a belief system inherent in so many of us – that life is about trade offs. If the relationships in my life are abundant and loving then it is okay that I have not attracted resources to myself – because if I had more money then I might lose the relationships or the love I have. And that is more important so it is okay to be poor or struggle financially. Being happy is good. Being rich is bad. If you are rich you are not happy. It is okay to be “rich” in love. “Money doesn’t buy happiness.” But sufficient money sure does make life more bearable and even more enjoyable. It offers more choice. Is this not a place most of us would like to be in – a place of more choice? Choice can be intentional with a little or a lot of resources at our disposal. Instead of focusing attention on what is on our path, what we can do to enrich the totality of our lives, we look to people who have more than we do – more money, more power, more choice. We make a few assumptions about them – how they misuse their power or their money or their choices. Have you ever heard or used the expression, “they have more money than brains”? It is easy to look at high profile people or situations – the banking systems, Walmart, Donald Trump and more – to point to greed we do not want to participate in. How can they live with themselves, we wonder. Then, we decide we don’t want to be like them anyway. Better to be poor, without power, without choice. Really? Most of us do not think about it so starkly. It becomes an unconscious, un-articulated justification for staying put, for perpetuating the familiar zone, for rationalizing the irrational choices or non-choices we make. Better to be the way I am, to continue the situation I’m in, then to become like the image of greed and irresponsibility I have created in my mind and assigned to real people I see or know who I believe have taken advantage of others, misused their power or their money. Better to be spiritual and pious than rich and corrupt. One or the other, not both. It is insanity, this belief system. As Abraham-Hicks says, “Your life is meant to be joyful.” Is your life joyful when you perpetuate struggle in your life? Is it joyful when you judge others by your impressions of their failings? It is joyful when you regret a past you cannot change at the expense of a future you can? Is it joyful when you desperately wish for things to be different but don’t act to make them different? What is the inquiry you need to be in to surface your own limiting beliefs and begin the process of releasing them? Where do you need to turn your attention and your thoughts to access appreciation and gratitude to make your daily life more joyful? What steps do you need to focus on to bring more abundance into your life – not just in one aspect, but holistically? How can your release the either-or dichotomies we are so often invited into to embrace both/and? Do not suffer fools gladly (especially yourself) and Go Get ‘Em!